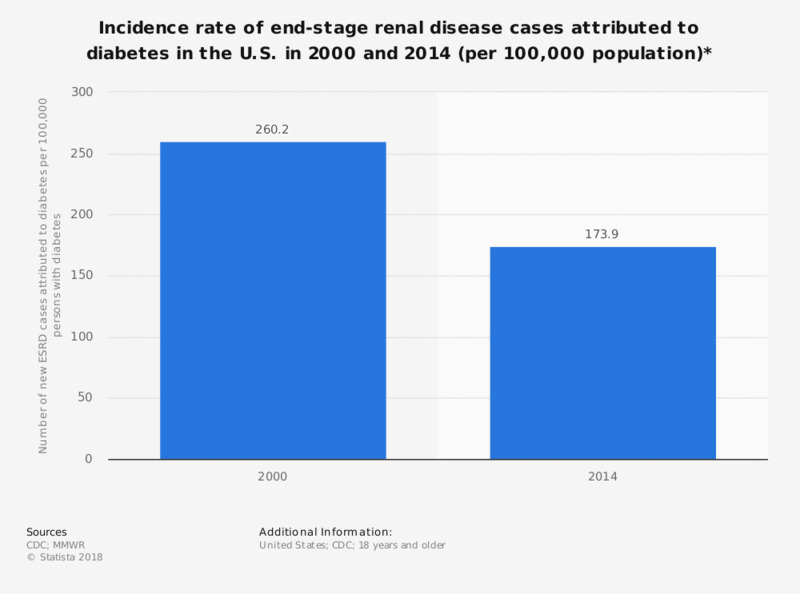 This statistic shows the number of end-stage renal disease cases attributed to diabetes in the United States in 2000 and 2014. In 2014, there were around 174 new end-stage renal disease cases attributed to diabetes per 100,000 adults diagnosed with diabetes. This was a decrease from an incidence rate of 260.2 recorded in the year 2000. * Rate per 100,000 persons with diabetes and age-standardized based on the 2000 U.S. standard population. Alaska, Vermont, and Wyoming were excluded because of the small annual number (<50) of new ESRD-D cases during the study period. Everything On "Kidney disease in the U.S. " in One Document: Edited and Divided into Handy Chapters. Including Detailed References.